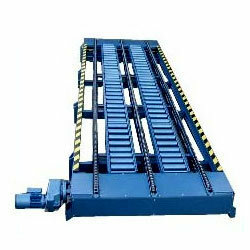 As per the demands and desires of the customers, we are providing them a quality assured array of Slat Conveyors. 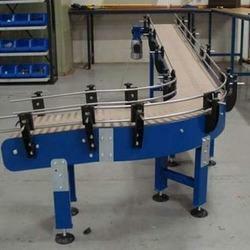 Our Slat Conveyors are extensively used in various industries for their various applications. Also, the smooth functioning of our conveyors make it first choice of the customers. We are engaged in manufacturing chain conveyors that are used for handling tracktive material. These chain conveyors are attached with various material supporting elements like cross rods, slats and wire mesh. Our chain conveyors are suitably the best for shrink tunnels, ovens and washing machine applications. Motorised Tripper, Shuttle Conveyor , Submerged Chain, Belt Conveyor , Belt conveyors. Roller conveyors, chain conveyors, Screw conveyors, Rack conveyors etc. The Chain conveyor is intended for horizontal transport if grainy, granulated and meal products and is used within the grain and feed stuff industry, in breweries and within other industries. It is produced in an industrial design, ensuring effective functionality and a long life. These machines are highly efficient and are well capable of performing heavy duty work. Manufactured using quality raw material, these abrasion resistant conveyors can be customized as per the requirement of our clients. TRANSLINE table top conveyor system ensures continuous filled container transportation smoothly online with the automatic control system which regulates the link between machines and operates as a single system. We have rich experience in building various types of material handling systems like Chain Conveyors, work cells, pneumatic/hydraulic clamps for variety of applications. These products can be built to suit various requirements like for harsh environment conditions, clean room systems, packaging lines, assembly lines. Sai Projects And Systems Pvt. Ltd.
Service: To convey lumpy material.